The Advertising Standards Authority for Ireland has received four complaints in relation to Government advertisements that were placed in local and national newspapers in relation to Project Ireland 2040. In a statement, the ASAI said the advertisements were not within the remit of its code and it is in the process of writing to all complainants to explain this. It stated that the primary objective of the ASAI is to regulate commercial marketing communications in the interest of consumers. However, it said the code does not apply to marketing communications, the purpose of which is to express the advertiser's position on a political, religious, industrial relations, social or aesthetic matter or on an issue of public interest or concern. It comes after Sinn Féin leader Mary Lou McDonald said Taoiseach Leo Varadkar should appear before the Oireachtas Public Accounts Committee to explain how public money has been spent on the Strategic Communications Unit. Ms McDonald said the SCU has now become "an issue of public confidence and ethical use of public monies". She said that in addition to an appearance at the PAC, "the Taoiseach should move to stand the unit down". The party leader was speaking on RTÉ’s News at One after Mr Varadkar earlier said the disbanding of the SCU will "have to be examined". Ms McDonald said the unit has been critically damaged and has been "seen to be a political rouse rather than a public service". She said it was used to heighten the public profiles of Fine Gael figures and the Taoiseach's own political profile. The party said it would table a Dáil motion at the earliest opportunity calling for the SCU to be disbanded. This morning, Mr Varadkar said disbanding the SCU was one of the options being looked at as part of a review announced last Friday. However, he rejected that the unit was set up to promote Fine Gael. Speaking on RTÉ’s Morning Ireland, Mr Varadkar said: "The unit was set up with a view to modernising and professionalising Government communications. It's had some success in that regard. "But it was set up as a unit that was established to better explain the work of Government and now it has become a distraction from the work of Government, so as part of the review that my Sec Gen is doing - and that is only going to take a few weeks - that is one of the options." Responding to accusations that have been made by Opposition parties that public money is being used to promote Fine Gael, Mr Vardakar said: "They have very scant evidence to back that up. "If you look at this whole issue around the articles, advertorials that appeared in the papers, if you take the regional papers, there’s 160 of those, the vast majority didn’t feature any politicians, only four featured non-office holders and only one of them was a selected Fine Gael candidate and that’s because he was standing beside Michael Ring in a photograph. "So if there was a conspiracy here to promote Fine Gael, it wasn’t a very good one." Martin Fraser, the Secretary General at the Department of the Taoiseach, has been asked by Mr Varadkar to conduct a general review of the unit. 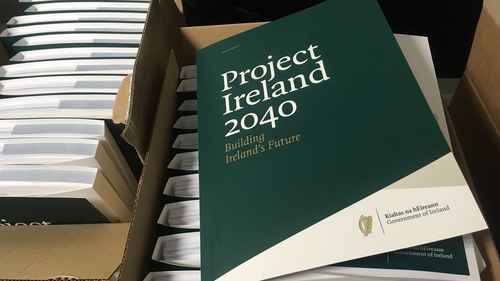 It follows severe criticism of the SCU over its handling of advertisements placed in local and national newspapers promoting the Project Ireland 2040. Opposition parties said the advertisements were made to look like regular news articles and featured Fine Gael election candidates. They were described in the Dáil as an abuse of taxpayers' money. However, the Government has insisted that the SCU had given instructions that all content in the local papers should be identified as being 'in partnership with the Government of Ireland' or 'in association with the Government of Ireland'. Fianna Fáil leader Micheál Martin has said it is time to call a halt to the unit, which he said should be depoliticised and taken out of the Department of the Taoiseach. He said his party wants it disbanded and it may table its own Dáil motion to do so. Speaking on RTÉ's Today with Sean O'Rourke, Mr Martin also raised concerns about the communications budget of various departments and State bodies, worth almost €180 million, being consolidated and brought under the Taoiseach's office. He also pointed to the use of some advertorials in newspapers in marginal constituencies and claimed the unit was about promoting the Government and Fine Gael.